Hello girls, today I have one more crochet pattern by Sophie "Ama Lilla Bjorn. 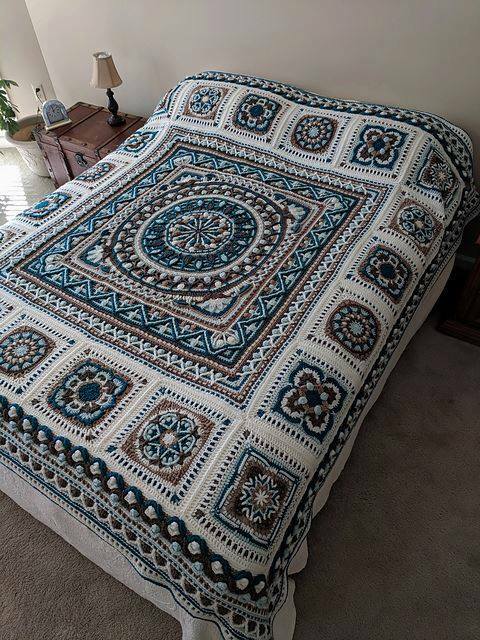 This pattern of crochet is simply wonderful, I received from a group of quilt patchwork that I have on facebook, and simply loved this pattern I even decided to post on our web site because I'm sure all the friends will like it very much, it's a crochet retail blanket with different colors, but all colors one tone. Blue is the color that reminds you of family, reminds you baby, reminds you of a bedroom. 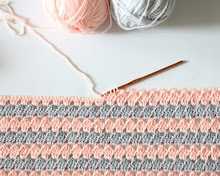 Very lovely this pattern of crochet including a step-by-step PDF of a catwalk and accompanied by a video for you that needs a more detailed step-by-step of this beautiful patchwork quilt crochet blanket. For the friends who accompany us, today I have published weekly crochet patterns that stand out most in our classes and can be sure that you will love these models that are very indicated by us students of patchwork. We take great pride and pleasure in making new circles of friends who enjoy this crochet and quilt work, and thank you for visiting our web site. Follow us and appear in our publications and will love every day more this excellent craftsmanship that every day enchants us more. A big hug!!! This is a pattern quilt patchwork template I found in PDF download dowloud and check it out. Follow and make yourself this beautiful winter blanket for this very interesting season is free. No puedo ver el PDF!!! Está maravilloso!!! Gracias por compartir. Hermoso!!! ; no sean egoistas, compartan el paso a paso.